The door of Hari opens for all here. It is after all one of the seven sacred cities for the Hindus. It is also one of the four cities where the drops of amrit fell while Garuda was flying with the pitcher of amrit for the devatas, so say the scriptures. It is the city where the holy Ganga takes everyone in her bosom, carrying them back to where they belong. It’s also the city where you can wash off all your sins, find solace in doing nothing and making attempts to merge with the creator. And it’s also a city which makes for a spiritual weekend escape from Delhi. After a stressful month, inspired by the movie Dum Laga ke Haisha, I thought it was time to discover God again and pushed off to Haridwar. Since childhood, I had seen my aunt driving to Haridwar almost every week and coming back with some sweets, red threads and copper utensils. It would make me wonder if there was a magic around these. 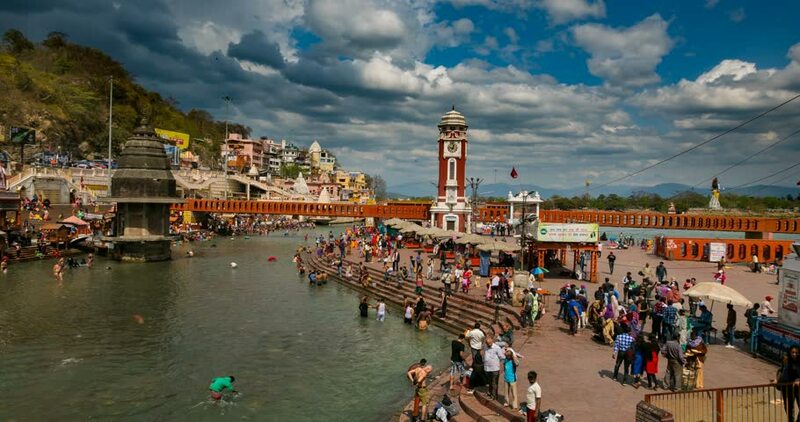 While I don’t do any religious rituals myself, I do enjoy watching them and listening to the prayers So my first stop is always the main ghat or Har ki Pauri. This is actually the Brahma Kund, the spot where the amrit fell. This is the home of the many gods living in Haridwar. It’s also where chaos reigns as hundreds of pandits offer their services to help you or your ancestors attain moksha. You could spend time browsing through their records or vahis where you might find your ancestral lineage. And even the list of sins the line has committed. It’s here that the Ganga is worshipped morning and evening with deep reverence which is a spectacular display of diyas and drums. My love lies in simply enjoying the rhythm of the waves and the symbols of faith around me. The flowers and diyas floating in the water, going up and down and finally swallowed by the mighty Ganga. Well, crossing the chaos of Har ki Pauri, I reach the marketplace with its many eating joints offering moksha from hunger. And it’s my nirvana place too. The shops at the back are the narrow abodes for those wanting to indulge in food made in desi ghee. It’s been more than 20 years that I have been visiting these shops. And the quality just doesn’t vary. And the servers and shopkeepers are always in a hurry. There are queues waiting to sit in the cramped first floor or eating outside. My favourite is the aloo poori with moong dal ka halwa and malpuas or sweet deep fried pancakes. This is actually the place where I had my first brush with this malpua. And it’s the only place where I commit the sin of forgetting to count the calories. Depending on the space left, a meal ends with a sweet lassi or simply water. It’s best to keep a paper napkin or handkerchief out as you might not get enough time to wipe out the ghee. Remember the queues! The food is eaten in disposable leaves, so it’s eco-friendly. Just a few minutes down the road is the ticket to temple of goddess Mansa Devi, one who makes one’s mann happy. This is atop Bilwa Parvat. There is the option of walking up to the temple, but I love the open cable car ride. I always end up buying the ticket for both the cable cars. After enjoying the spectacular view from Bilwa Parvat, it was time to experience Neel Parvat. A bus took us there. Goddess Chandi’s temple was constructed in 1929 A.D. by Suchat Singh, king of Kashmir, atop this hill. Stories from the Skanda Purana state that Chanda-Munda, army chief of demon kings Shumbha and Nishumbha, were killed by goddess Chandi here. It is believed that the main statue was established by Adi Shankaracharya in 8th century A.D. Obeisance paid, it was time to move to the ashrams a little ahead. I always enjoy sitting in these two places. Sapta Rishi is an interesting spot as this is where the seven great Hindu sages–Kashyapa, Vashishtha, Atri, Vishwamitra, Jamadagni, Bharadwaja and Gautama–meditated. The Ganga split into seven currents here so that the sages would not be disturbed. It is the spot where my desire is to meditate often. At Shantikunj, I normally enjoy hearing the Gayatri mantra recitation. There is also a havan performed on special occasion which completes the spiritual quest as I watch the smoke take away the stress into the sky, merging with the creator carrying my wishes. Did I find God? I don’t know but I do enjoy the sound of prayers going up high into the infinite sky, the bells ringing to wake the spirit and the diyas flowing on the waves of the holy river, carrying the hopes and hearts of thousands who come here daily. By road: Haridwar is connected by NH to other cities in the state. NH 58 connects Delhi and Haridwar, going via the cities of Ghaziabad, Meerut, Muzzafarnagar, Roorkee and Badrinath (around 200km). Kashipur, Kichha, Nagina, Pilibhit and Bareilly are connected through NH 74. By rail: There are direct trains to and from Delhi, Mumbai, Kolkata, Chennai, Indore, Jaipur, Ahmedabad. Some trains from Delhi are Shatabadi Express, Jan Shatabdi, AC Special Express, Mussoorie Express. By air: Jolly Grant Airport, Dehradun, about 35km from Haridwar.